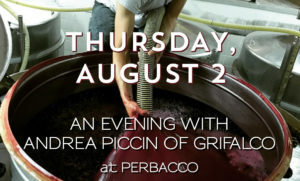 Join us for an evening with winemaker Andrea Piccin of Grifalco this Thursday, August 2 at Perbacco. Grifalco specializes solely in Aglianico, a unique grape indigenous to southern Italy, revered since ancient times. At the end of the Apennine Mountains, in the rural region of Basilicata, on the slopes of the extinct volcano Mount Vulture, the Piccin family lovingly cultivates their vines, creating wines of distinct, site specific character. Andrea will be the in the dining room pouring three of his family’s award winning Aglianico del Vulture wines and sharing more about winemaking in Basilicata. 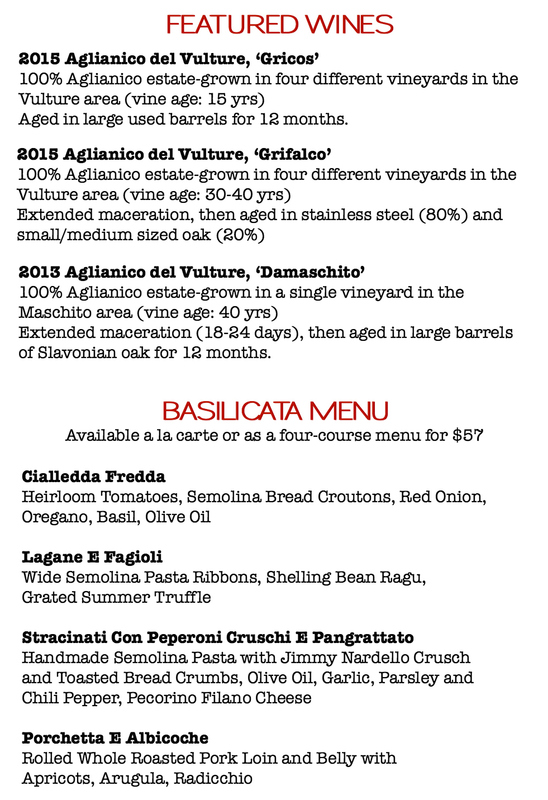 Chef Staffan will have four special dishes to pair with the wines available a la carte or as a $57 Basilicata Menu. To reserve a table to join us this Thursday, please do so online or by calling (415) 955-0663.